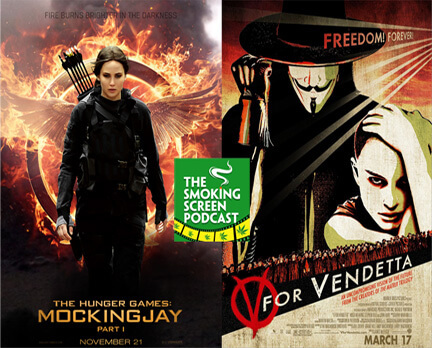 With Cybill still away, Jay strikes out on a totalitarian tangent and reviews Jennifer Lawrence in the Hunger Games: Mockingjay Part 1 and Natalie Portman in V for Vendetta. Which one of these dystopian futures does Jay prefer? Is it even a far comparison? Join us as we take our fight for cinematic excellence into the streets. This revolution will not be televised, but is conveniently available in podcast form. Join us for Episode 37!